I have to say I don’t go there all that often, mainly due to the fact that frankly I can’t draw for toffee. In fact I’d struggle to draw some toffee or any kind of sugary confectionary. 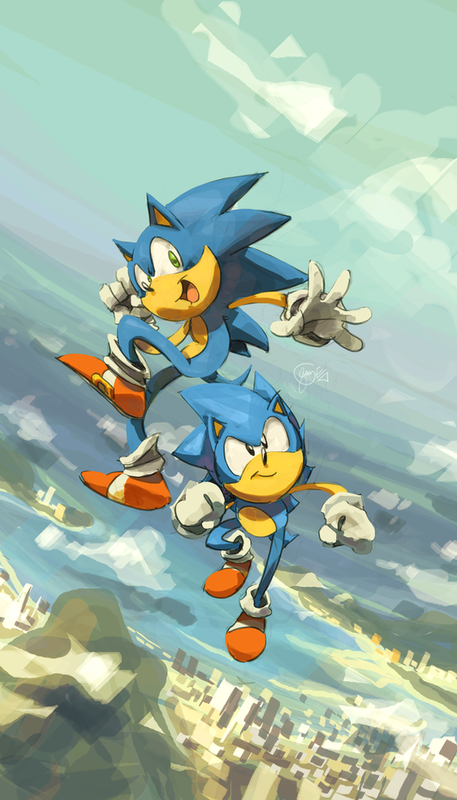 So it can be considered quite something that I blindly staggered in there at an ungodly hour this morning and found this piece of Sonic Generations related artwork by edtropolis, entitled “Save The World”. Myself and Nemain had a long discussion about it as it impressed us both with its rather original stylings and we wanted to show you guys it. That looks beautifully made, the colouring and the style of it looks amazing. Though not so much with the existing sketch lines in the background. Could say the same thing about the outlines on the characters, but hey, it’s their own style.